Keep your binoculars nearby as you eat breakfast or as you enjoy cocktails on the screened balcony of this spacious 1550 sq. ft. condominium. The view of the intercoastal waterway is stunning! You can watch manatees and dolphins, or kayaks and gorgeous yachts! You can also watch the boats come and go from the on site marina, fish from the marina docks or cast a line from the nearby fishing pier just a 2 minute walk away. The unit is a top floor (6th) corner and is very quiet. There is a minimum rental of three months due to condo association rules. Both bedrooms have king size beds and private bathrooms. The family room has a new queen size sofa bed and a privacy curtain which can be used when you have guests. The complex has a large pool, clubhouse with exersize equipment and a picnic, grilling, and Tiki bar area with a small beach. The grounds of this pristine property are perfectly manicured. More pictures are available upon request. The Jupiter/Palm Beach County area itself is one of the few places in South Florida that is both beautifully maintained and sophisticated yet has a laid back atmosphere. The beaches are varied and every one of them is stunning; most have picnic areas, many have trails and ALL have abundant wildlife! You can watch (or attempt) windsurfing at Juno Beach, watch the water spray through holes in rocks like geysers at Blowing Rocks Beach, go snorkling at Coral Cove or let the little ones swim in a quiet lagoon off the main channel while the others fish or watch the boats come into the Jupiter Inlet. Or, for the more adventurous, climb the dunes or rent a canoe and see abundant alligators at nearby John Pennecamp State Park. And that's just the beginning! There are also fabulous restaurants, theaters (live and multi-plex) nearby as well as golf courses and museums. The exclusive shopping area on Palm Beach Island is only 30 minutes away, the Gardens Mall only 20. This part of Florida has something for everyone! Ask us for additional picures including aerial views. This property has been enjoyed by our family since it was first built. We are the original and only owners and have maintained it carefully. It has never been continuously occupied. Jupiter, Florida is such a great location that after visiting the condo, originally owned by my parents, from my home in North Carolina, I moved my family to nearby Stuart where I raised my children. I now live near Tallahassee. There is something for everyone here from the active to quiet and from young to old. You can see Jupiter inlet and the ocean from our balcony. The Jupiter lighthouse is visible from the front door. Newly remodeled club house offers fitness equipment. Lovely location in building on top corner-quiet and private. Beautiful view of the lighthouse, inlet, draw bridge and intercoastal waterway filled with wildlife and boats of all sizes. 4 chairs around table in kitchen and 3 around table in dining room although more could be added. There are also 4 chairs around an outdoor table on the balcony, our favorite place to eat! The condo complex has beautifully maintained gardens and lawns. Beautiful large pool with clubhouse on site. 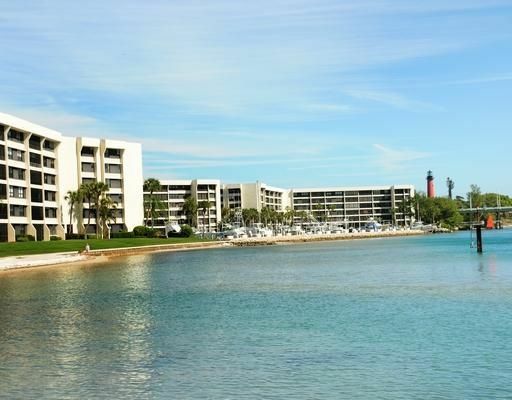 This condo on the Intracoastal Waterway is spacious and comfortable with a very well equipped kitchen and comfortable beds. We have enjoyed sitting on the large lanai watching the activity on the Waterway and the view out to the ocean. There are many wonderful restaurants and shopping centres nearby. The large property has a huge swimming pool, tennis courts, a barbecue area and beach, marina and covered parking. The owner has been a great person to deal with and has done a very good job in making this condo a place where we have immediately felt at home. We are planning to return and would recommend it to couples looking for a comfortable home away from home. Application fee is paid to the condominium property manager. An application process and interview (phone if not local) will be needed as all renters must be approved by the condominium association. $1500 refundable security/damage deposit to hold unit. 1/2 rent and cleaning fee of $250 due upon association approval and 1/2 due 60 days before occupancy.